Freud DS0614BGP25C 6 in. x 8/14 TPI Reciprocating Saw Blade for Nail-Embedded Wood and Metal (25-Pack) is specifically designed for maximum performance in general purpose (nail-embedded wood and metal) applications. These high performance blades feature bi-metal technology that delivers up to four times longer life of standard blades on the market. 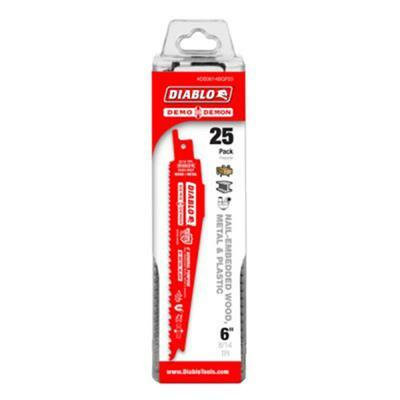 Diablo's patented variable tooth technology provides faster cuts with less vibration.